A protest turned violent at the University of California at Berkeley, resulting in the cancellation of a talk from editor of Breitbart News Milo Yiannopoulos. Milo Yiannopoulos was expected speak against “sanctuary campuses,” which promised to protect undocumented students in wake of President Donald Trump's tough stance on illegal immigration. In response to the violence, UC Berkeley Police have warned students to "leave the area immediately," as they are bringing in "additional resources." Hours after a lockdown was declared across campus by police, many orders of dispersal, including several five-minute warnings went largely ignored. Once those backup forces arrived, police used a bullhorn to warn protesters they would be subject to force, "including but not limited to chemical agents, batons and less lethal munitions." KTVU reported that there were no police present when the riots began. College Republicans paid a mandatory security fee but are now asking what good it did. Around 8:00pm local time, protesters moved off campus, onto surrounding streets including Telegraph Avenue. Rioters attempting to block traffic did not appear to stop a white BMW that sped off with at least one person still clinging to the vehicle. The unruly crowd then chased the car down the street, but Michael Bodley of the San Francisco Chronicle reported that a different, unrelated driver was then attacked with pepper-spray while his vehicle was struck with stakes. "It was a white car," Bodley reported someone yelling. People took off running after the car. Mistakenly surrounded another - wrong place, wrong time - who was assaulted. Driver OK, I think. A Walgreens pharmacy was spray-painted with the words "Kill fascists," while Bank of America ATMs were smashed. A female Trump supporter was attacked with pepper-spray by a rioter during an interview with local TV media. Others were struck with flag poles hoisted by black-clad anarchists. Another woman was seen being hit with a black flag and pole before being pepper-sprayed. A rioter dressed in black was captured on video reportedly striking an attendee in the head with a bike lock. There were also reports of punching, as well as fireworks thrown and a tree being set on fire. Hundreds of protesters, some covered in masks, also broke windows and pulled down metal barricades that police set up, the San Francisco Chronicle reported. There are reports of outbreaks of physical violence and rioters attempting to surround attendees, whom they deemed "fascists." Berkeley Police reported their officers were targeted with projectiles, including bricks and smoking objects. The university's police locked down campus buildings and ordered the public to shelter in place. Tear gas was deployed after many calls from police for the crowd to disperse or face arrest for unlawful assembly. There were several five-minute warnings proclaimed from police PA systems. BREAKING: The scheduled performance by Milo Yiannopoulos has been cancelled. More info to come. 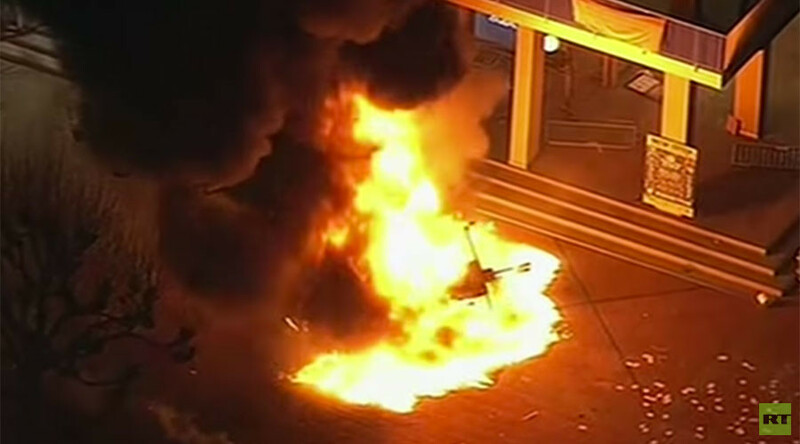 "We condemn in the strongest possible terms the violence and unlawful behavior that was on display and deeply regret that those tactics will now overshadow the efforts to engage in legitimate and lawful protest against the performer’s presence and perspectives," UC Berkeley's Public Affairs office said in response to the riots. Students were not the only ones to have objected to Yiannopoulos event at the university. “Although we object strenuously to Yiannopoulos’s views — he advocates white supremacy, transphobia, and misogyny — it is rather his harmful conduct to which we call attention in asking for the cancellation of this event,” read the first of two letters from faculty members. The College Republicans issued a statement, saying, "The Free Speech Movement is dead. Today, the Berkeley College Republicans' constitutional right to free speech was silenced by criminals and thugs seeking to cancel Milo Yiannopoulos' tour. Their success is a defeat for civilized society and the free exchange of ideas on college campuses across America. We would like to thank UCPD and the university administration for doing all they could to ensure the safety of everyone involved. It is tragic that the birthplace of the Free Speech Movement is also its final resting place."